Schwartz who passed away from cancer in 2011, continues to serve as an inspiration! Carlsbad, CA (December 11, 2013) – As collectors studied the 2013-14 NHL® Upper Deck Series One checklist they saw the name of a hockey player that never played one game in the NHL®. 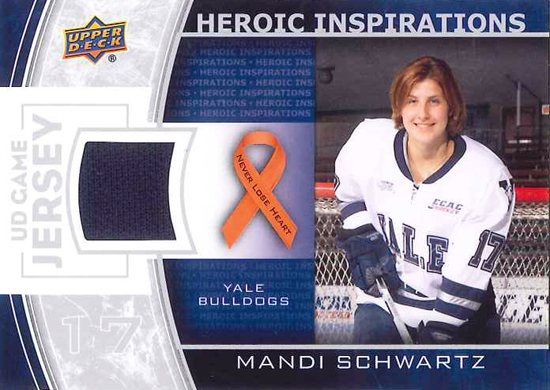 Upper Deck staff had been working closely with the family of Mandi Schwartz and the Yale Athletic Department to create a unique collectible as a way of honoring the former Yale Hockey star while also creating awareness for her charitable organization the Mandi Schwartz Foundation (www.mandi17.org) Schwartz will appear in the game-worn jersey and game-worn patch sets for the company’s flagship release which is available in stores now. What makes these cards so special of course is that they contain actual swatches from one of Mandi Schwartz’s game-worn jerseys. Mandi’s parents donated the blue Yale jersey to help bring these unique collectibles to life. Upper Deck intentionally short printed the game-worn jersey cards available in packs however and is making the lion’s share of them available to be sold through The Mandi Schwartz Foundation. The game-patch cards can only be found in packs and are limited to just 15 total copies. Mandi was initially diagnosed with cancer in December 2008, during her junior year at Yale. After treatment put her in remission, she returned to school in January of 2010 and was planning to play hockey again, but relapsed. She passed away at home in Saskatchewan in April of 2011 at the age of 23. The Mandi Schwartz Foundation will be releasing details on how fans can purchase these limited-edition collectibles in the coming weeks. In the meantime, Upper Deck encourages everyone to check out the official Mandi Schwartz Foundation website, to follow the Schwartz Foundation on Twitter and to like the Schwartz Foundation Facebook page. Together we hope we can help save lives by creating awareness for Mandi’s cause and the need for donors throughout the world.